Emerson has introduced a guided wave radar (GWR) verification service to help users verify their Rosemount level instrument performance. Standards, regulations and calibration requirements for GWR instruments used to measure tank level must be adhered to by process plants. Verifying GWR level instrument operation traditionally involves climbing to top of the tank, opening an access port, and taking a reading by hand. In order to get the multiple measurement points often required for accuracy, product has to be transferred in, out, or both — disrupting the process. It is an expensive, time-consuming and labour-intensive process with serious safety considerations due to the height at which the work is performed, and potential exposure to hydrogen sulphide and other hazardous chemicals. With Emerson’s new service, technicians go to the client’s location and provide verification without any disturbance to normal operations. Five-point accuracy verification is performed using calibration hardware with traceability to recognized standards. In addition to verifying accuracy and making any required adjustments, the GWR level instrument’s condition and configuration are evaluated to ensure optimum performance. The plant receives a certificate showing the level instrument meets specifications designed to comply with the ANSI Z540-1-1994 standard. 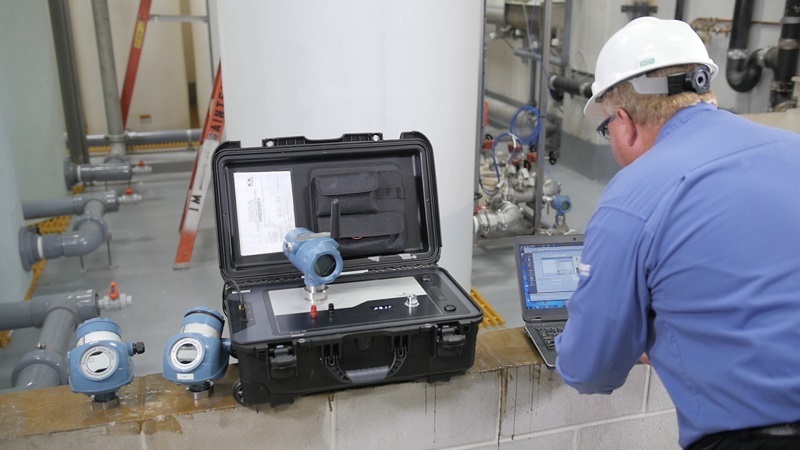 When used in oil and gas applications, this service can provide the inspections required by regulatory organizations, and can also verify measurement accuracy for custody transfers. "Most GWR level instruments have to be verified annually," says Christoffer Widahl, senior strategic product manager at Emerson. "Companies don’t like sending their people up on top of tanks, and moving enough product in and out of a tank to provide the required range of calibration points is a major disruption. Our service can verify performance across full range without breaking the tank’s seal. This is much quicker, more accurate and safer than alternative methods." Companies can schedule this service during normal operations, or during planned shutdowns or turnarounds. This service is currently available for Rosemount R Series 3308 and the 5300 GWR level instruments, with more GWR level instruments being covered in the near future.